Darren Espanto, the guy with amazing pipes and billed the “Total Performer,” seems to have everything going for him at such a young age. From a runner up in The Voice Kids, there was no stopping Darren from reaching the top after the competition. A Platinum award for his debut album Darren, three no. 1 singles, countless awards from award giving bodies in the Philippines and concerts and gigs left and right are just some of Darren’s achievements. Add to that, international artists Nicki Minaj noticed him and so did Ashton Kutcher and Fantasia Barrino for his videos of him singing in a radio station bus showcasing his powerful vocals. The videos have gone viral. Flying from his hometown Calgary, Canada to Manila for a dream paid off. He knows he wouldn’t be there without the support of his fans- the Darrenatics. That is why for his sophomore album, released just in time he celebrates his 15th birthday, he wants them to still be with him with the album title Be With Me. “I want to take you guys along my journey as an artist, as a musician and I just wanna express myself through music. Since music is my passion, I just wanna share what talent God gave me,” Darren said. With top-notch producers Kiko Guevarra, Jungee Marcelo, Jay-R, Kiko Salazar and a line-up of international and top Filipino songwriters, the standards of this sets this album from his previous one. “It’s a bit different from my debut album that it’s more mature. The recording process for this album was actually a lot of fun. I got to work with a lot of very talented songwriters and each song has a different message and a different sound to it,” Darren said. “Starlight”, by Singaporean songwriter Amir Masoh (Jacky Cheung, Ziana Zain), likewise topped iTunes Philippines Singles Chart on its first day of release. “It’s about living in the moment and having just one life to live. It’s kind of like a “YOLO” you-only-live-once anthem, so it’s pretty fun, you could dance to it, it’s EDM. It’s a great song to listen to as well,” Darren said. This also signals his growth as an artist having penned two songs in the album: “Hanggang Hi Hello” and “Home”. “I actually wrote two of the songs on this which is really, really different for me because I’ve always been so hesitant with sharing the songs I write, but now, I guess I was confident enough to share it and now it’s in my upcoming album. I wrote “Hanggang Hi Hello” originally when I was eleven but then I changed some of the lyrics to fit my age now. And then ‘Home’ talks about just wanting to be home…and it’s a ballad. It’s actually one of my favorite compositions, I’d say,” Darren said. Other tracks to watch out are “Alam” by Jungee Marcelo, “Be With Me” (Kiko Salazar), “Surrender” (Jay R, Flavamatikz of Q-York), “My Baby & Me” (Allan Eshuijs, Marco Rakascan, Maruja Retana Fransen) and “Talking Bout Love” (Kris Coutinho, Ricardo Burgrust). 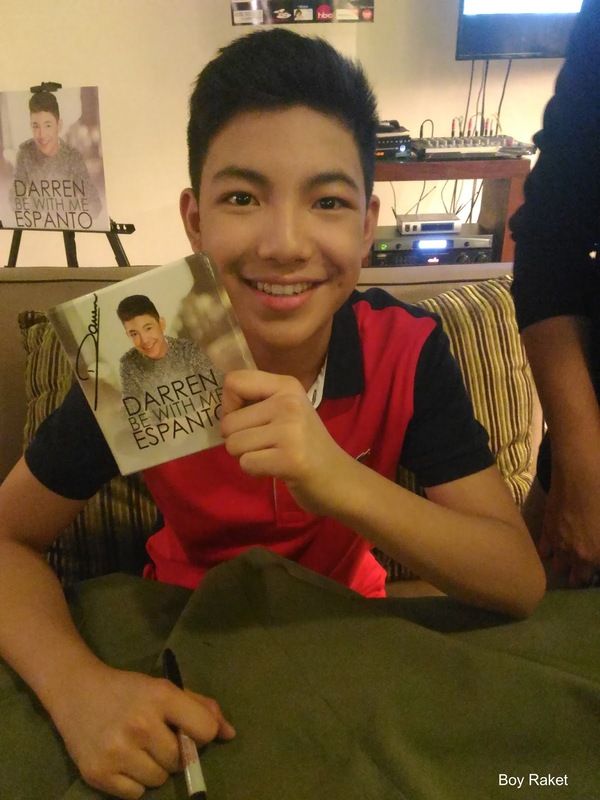 Darren considers doing the album Be With Me a learning experience. “I got to learn more techniques in Be With Me and I got tips actually from each of the song writers that I worked with. And I guess I developed a new sound as well. So that’s how I developed in this album,” Darren said. Join Darren as he continues his musical journey which with his talent will span for years. Be With Me is now out through digital downloads and streaming via Spinnr, iTunes, Apple Music, Spotify and VEVO and in CDs at Astroplus and Astrovision outlets. Catch Darren at his major concert entitled D Total Experience on June 25, 8 p.m, at Kia Theater with special guests Jed Madela, Maja Salvador and G-Force. Call Ticketnet at 911-5555 for tickets.